If you have younger guests, consider a cotton candy bar instead. Remember, cotton candy comes in all sorts of colors so don’t be afraid to experiment and get a little crazy! Create a photo wreath — all you’ll need is a piece of poster board cut into a circle (about 4-5″ wide) and lots of photos of the grad! Use a hot glue gun to quickly collage the photos on the poster paper and add a bow at the bottom with your grad’s favorite colors. Hang your DIY wreath on the front door so guests 1. know they’re at the right house 2. can admire your handy work! Decorate a box for cards — it might seem small but both you & your guests will appreciate a designated drop-off box for cards. Wrapping paper or construction paper are easy options for decorating and are easy to match to the party theme colors. Place the box at the entry way of your party so no one has to worry about misplaced cards. Capture all the moments with a photo booth — it might seem overdone but guests still love a good photo booth. Consider making your own props (think paper mustache, big lips, sunglasses, graduation cap) and use a colorful sheet as a backdrop. You can have a Polaroid camera available or ask guests to share their photos using a specific hashtag so you can see all the silly moments you might have missed. Consider an unconventional guest book — If you’re sending your grad off to college, send a fun game with them! Have your guests share a memory or words of wisdom on Jenga blocks and send your grad off with a fun game, filled with great memories. Every time they play, they’ll be reminded of their great graduation party! Host Graduate Olympics — in the spirit of summer and outdoor events, consider arranging a series of games for people to play throughout the day. Some great options include: corn hole, ladder ball, Twister, 3-legged sack race, Kan Jam and horseshoe. Ask friends or family members if they have any of these games so you don’t end up spending more money than you need to. No matter what you do, be sure to take lots of pictures and savor every moment. Graduation is a huge milestone and deserves to be celebrated! 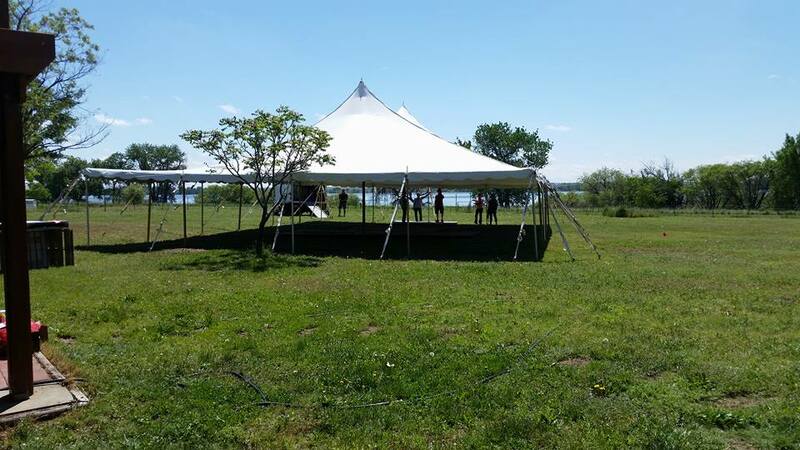 For more creative ideas or help planning your outdoor graduation party, give Benson Tent Rent a call!